Mac Fleet of San Diego leads the pack of high school runners at the Portland Track Festival in Oregon. The runners were trying to clock a mile in less than four minutes. In sport, no matter how much athletes evolve, there are achievements that remain elusive — if not unattainable. Examples include Joe DiMaggio getting a hit in 56 consecutive baseball games, or basketball star Wilt Chamberlain scoring 100 points. In track and field, only four American high school athletes have run the mile in less than four minutes. That group includes Jim Ryun, who was the first to do it 45 years ago. Despite the difficulty, high school runners keep chasing the sub-four-minute time. It's an annual quest where anticipating the accomplishment fuels both runners and spectators. 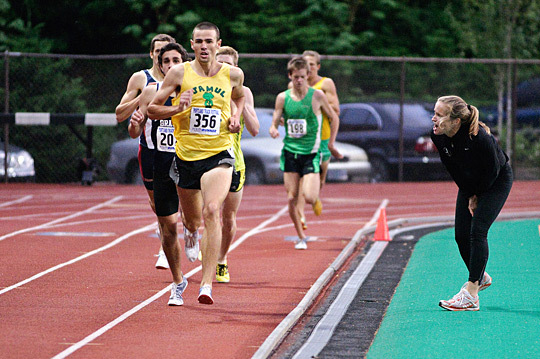 In mid-June, on a cool, drizzly evening in Portland, Ore., the Portland Track Festival was almost over. Those in the stands and down on the track at Lewis and Clark College were focused on two big events: one in Portland and another 1,800 miles away in Illinois. As 10 high school boys in Portland warmed up for the mile run, the premiere event of the festival, the similar race had just ended in Illinois. The track announcer gave the result: Andrew Springer, an elite high school middle distance runner, won the Midwest Distance Gala mile run in 4:02.70. It was a great time, but it still didn't crack the mythical four-minute barrier. Thus, the runners in Portland started their race knowing they had the last shot of the day at sub-four minutes. Led by nationally ranked middle distance runners Mac Fleet of San Diego and Robby Andrews from New Jersey, the pack took off with a common goal — running four laps, 60 seconds or better each time around. Rather than running against each other, the unique strategy for cracking four minutes was to run against the clock. "All of our big athletes here, we kind of have to put our egos aside," Fleet said before the race. "We really have to go after the times and not race." Halfway through, though, the clock was winning. Needing to hit at least a two-minute time, the clock read 2:04, 2:05 as the leaders passed by. It was time to pick up the pace. "Some guys are swinging for the fences today," said Portland Track Festival director Craig Rice. "Better to go for sub-four and blow up and run something you'd be unhappy with in a competitive race. Trying to break four minutes really is a rite of passage for the top milers. You have to take your shot." Someone runs a fast time early on in every track season, says Rice. "They get under 4:10 or something like that," Rice says. "And then the talk starts. People start to wonder, 'Is it going to happen this time? Is this the guy that can do it?' "
The answer usually is "no." After Ryun broke four minutes in 1964, he and two others ran sub-four-minute miles the next three years — 1965, '66 and '67. Then, nothing until 2001. That's when Alan Webb set a new high school mile record. Why the droughts? Theories abound. The switch to the metric system in track and field in the 1970s meant fewer races at the mile distance. The trend in the 1980s and '90s, in large part, was for young track athletes to undergo less intense training sessions. That also might have had a chilling effect on sub-four times. Whatever the reasons, a barrier that's regularly broken at older ages remains a barrier for those in high school. In Portland, the 10 runners tried mightily to break the magic mark. In the end, Fleet won, but in a time of 4:02.90. It was a new personal record for the young man who next year will join the University of Oregon's storied track team. He missed sub-four, but said afterward he couldn't really be disappointed. "You can't be ... because it's such a prestigious mark," Fleet said. "No one is ever favored to break four minutes, especially in high school. There's a reason only four people have ever done it." Fleet seems destined to break four minutes, but as a college student. And next track season, the best high school runners will try again.